Health Shield offers a wide range of health cash plans to suit all needs and budgets. You can even tailor your own plan specific to the needs of your company. Established in 1877, Health Shield is a non-profit friendly society who provide health cash plans to companies and individuals throughout the UK. Health Shield offers a range of cash plans, including standard or tailored schemes on a voluntary, company-sponsored or flexible benefits basis. Its most popular benefits are dental and optical, but plans can also provide access to a 24-hour freephone helpline, physiotherapy as well as health and wellbeing treatments. The plans also give access to its Employee Assistance Programme, which provides counselling, support and guidance on a range of lifestyle, health, medical and legal problems from specialist teams of counsellors, lawyers and medical staff. 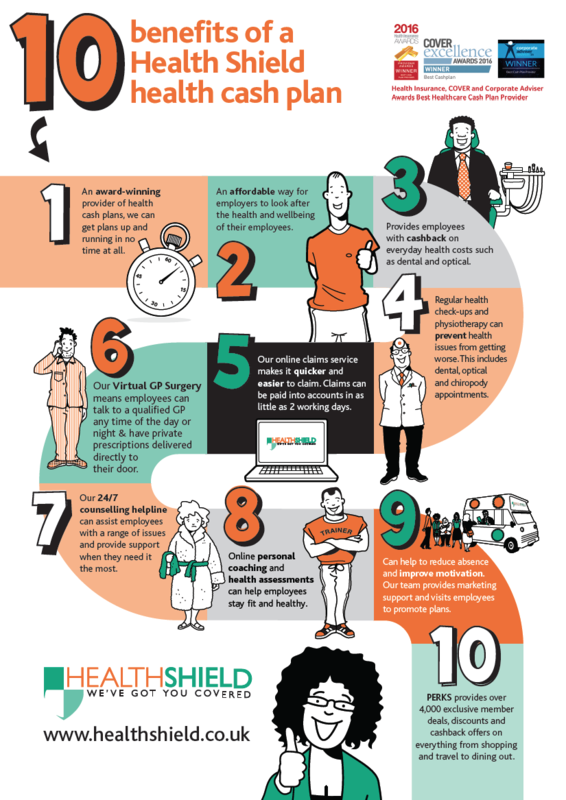 Health Shield has a key performance indicator to process 85% of all Claims within a 2-day period. It paid over half a million claims in 2016 and accepted more than 95% of claims, paying out a claim on average every 20 seconds. Which of our health cash plans is right for you and your company? We offer a range of company paid and voluntary cost-neutral plans to suit your needs and budget whether that be a completely bespoke, fully branded scheme, or a health cash plan for companies with less than 10 employees! You are never too big or too small to look after your employees. Benefits include: 24/7 Counselling and Support Helpline, Virtual GP Surgery and Private Prescription Service and an Employee Assistance Programme available on selected schemes. Among numerous other benefits we cover dental treatments, including practice-plan premiums and tooth whitening, plus a health and wellbeing benefit that covers 21 alternative therapies. For further information about our Health Cash Plans and how they could benefit you please contact us on 01270 588555. We’ve got one of the largest health cash plan sales teams in the country. Each region has a Business Development Manager who can quickly supply quotes, implement plans and arrange a site visit to increase scheme awareness and take-up. Contact us on 01270 588555 to arrange a visit from one of our Business Development Managers.